Just had a great day out on the bike. I’ve accepted that a great day out for me these days doesn’t equate to a win… those days have moved quietly away… but greatness is so easily measured in other ways when your glass is half full. I do go on a bit about the National Trophy course at Peel Park in Bradford. It ticks every box for me every time I’ve ridden it. I’ve had good rides and bad rides the but I’ve never come away unsatisfied with the venue or atmosphere. It’s just one of those parks that has the right topography and meteorology for a right old muddy cyclocross knees up. Even last year in disappointing frost and on the better drained years it’s just such a great course with proper run ups, lines to take, bits to play to everyone’s strengths and weaknesses. I’m a bit paranoid that my obsession with skills and experience in cyclocross of late has come as a replacement for raw fitness. It’s easy to wax lyrical about uninspiring fast courses that demand as much skill as the average lap of an Indy 500 but in such a mild and relatively dry autumn, I’ve been dying for today. I have to accept that I’m NOT pedalling as powerfully as I might have done a few years ago, but when a course rewards you for staying on good lines and keeping yourself out of trouble, I’m bound to enjoy it. The result is tenth… or “one minute down on 4th” as I optimistically see it. The bikes today were just spot on. This was the type of course that I spend ages planning my bikes around. Perfect tubulars with perfect mud ears. Bikes that don’t clog with the earth and leaves spat into it every second… It’s like a justification of all the obsession. I love it when a plan comes together. In the event itself I finished that little bit higher than I might have done on a less technical course. I felt positive gains coming at various points of the course, and added up across the forty ish minutes, they made enough difference to put together a really satisfying performance. Could have been better… But could have been so, so much worse. The only big fly in the ointment (and this just proves how beautifully just and fair cyclocross is) was a broken rear gear hanger (right) about 400 metres from the finish. It cost me a place but more significantly it was simply my fault. If I’d have elected to change my bike half a lap before when I should have, or to have ridden in the little chainring when I should have, it wouldn’t have happened. ‘that’s justice’ as Vic and Bob would have put it. Always room to learn. Always margin to improve. 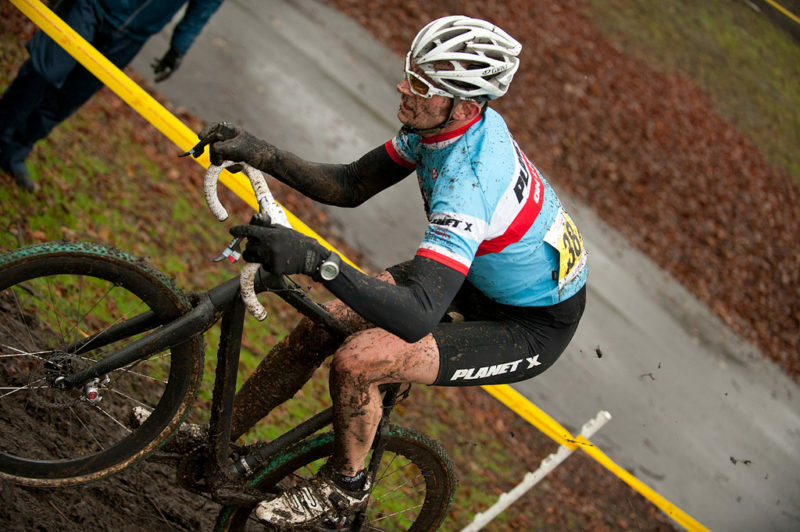 Love cyclocross. Big thanks too to Andy Waterman and Jo Allen for helping out with pits / clothing in the lack of a big team setup – favours like those go a really long way.